The Coalition for Networked Information (CNI) convened a workshop in Washington, D.C. yesterday entitled ‘Authors, Identity Management and the Scholarly Communication System’. Attendees included publishers, university repository-builders, and authority control experts from the Library of Congress. A number of us gave presentations about our activities and there was time for a decent amount of discussion about the various issues faced by the different constituencies that were represented. Availability of the data may be an issue, in relation to privacy. Much may already be in the public domain, but bringing information about the affiliations and works of an individual into one public place may open the data to uses (perhaps commercial) that have not heretofore been possible. Thus it may be best to share the data only with trusted partners and to support queries, rather than to make the entirety available. CNI will be producing a report of the meeting, which I’m sure will be more comprehensive than these notes of mine. 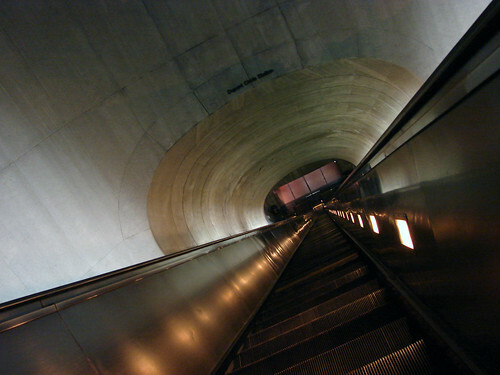 This Flickr image from AlbinoFlea shows the vertiginously long escalator at the north exit of the Dupont Circle Metro station in Washington. It wasn’t working when I arrived on Sunday night – walking up it with my bags was not much fun. Maybe it’s a sly attempt by the city authorities to improve the fitness levels of Washington’s citizens.